Brainy Girls! : What's the Deal? Are Daddy Longlegs Spiders or Not? I know that spiders are not insects, but in my previous post I brought them up so I'd like to answer my own question. Because usually when I see something that resembles a spider with very long splindly legs, I get totally freaked out and get away from it before I have any real time to take a good look at it. 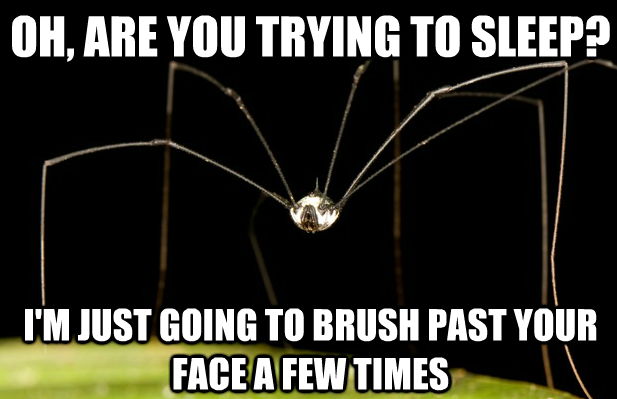 You know what I'm talking about: daddy longlegs. 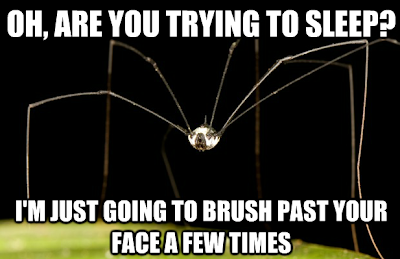 For some reason, I can tolerate most spiders, but daddy longlegs have always been my personal nightmare. I literally have had nightmares about DLL (let's just call them that for now) falling on me while I sleep. But enough about me...let's talk about THEM. 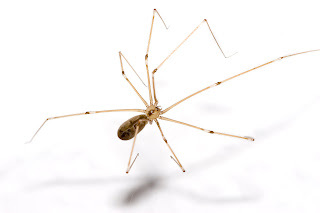 What the heck are daddy longlegs? Generally, there are two different arachnids that people call DLLs. One of them is a spider, and one of them is not. Spiders are a type of arachnid, just like butterflies are a kind of insect; there are lots of other kinds of arachnids, just as there are lots of other kinds of insects. See? 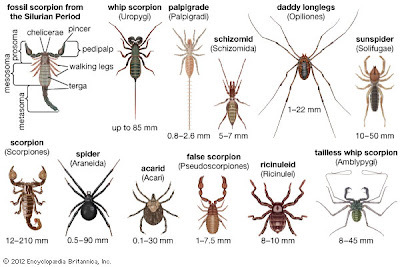 The figure above shows daddy longlegs as being in the order Opiliones, which are also known as the harvestman. You run into these guys a lot outside, crawling over leaves and minding their own business. They are not spiders; their bodies are made up of only one region (spiders have two), and they have two little eyes instead of the usual eight that spiders have. The other critter that people call DLLs are spiders, such as the house spider Pholcus phalangioides (see picture below). These are the ones that hang out in your basement, the corners of your ceiling, and give me nightmares. They have two body segments and eight eyes, like regular spiders. Now, what about the deal where people say that DLL have the most poisonous venom but just can't use it because their fangs are too small? FALSE!!! 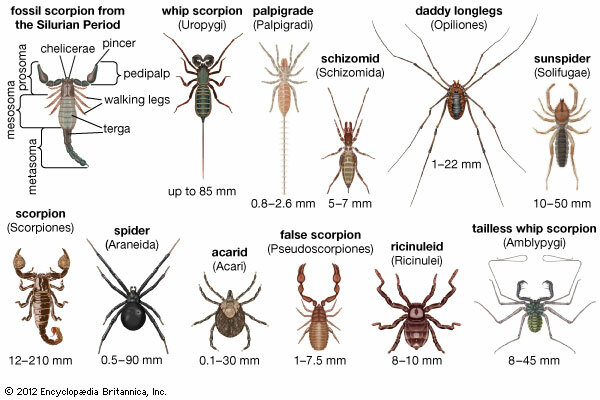 I did some checking up on this too, and it turns out that the harvestman has no venom at all, and while spiders in the family Pholcidae do have venom (like most spiders), there is nothing special about it; and in fact, its effect on insects can be relatively mild. 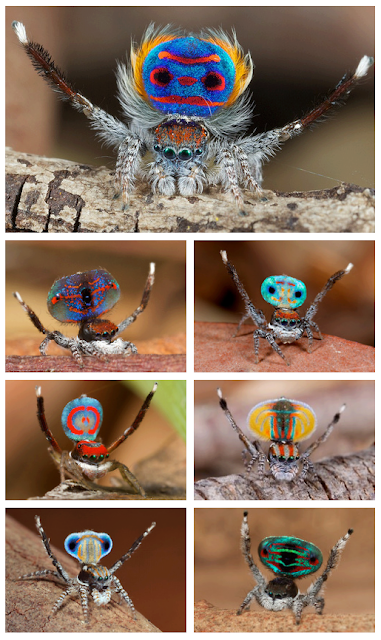 And there are even spiders that are incredibly beautiful (and small, thankfully), including the gorgeous peacock spider. You can read more about them at It's Okay to be Smart. Thanks for learning some new things about spiders with me! What other fun facts can you share about spiders? Spiders...shiver! My brain understands their place in the grand scheme of things, and they're wonderfully good at what they do. Slugs have a niche, too, but yech! My little brother picked up a tarantula from a dirt road in Mexico and made it his pet. I was older and was not in the house at the time. Whew! Anyone know a cure for arachnophobia? I want to appreciate all life. Not want to smash it. You're brave...writing where the rest of us are too queasy to go-!! I had trouble getting through this post (can you say arachnophobia?) but I did learn something so - thank you. I thought they were spiders. Interesting. DLL don't scare me. Now, those other pictures are horrifying.